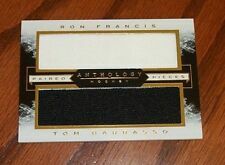 2014-15 Francis/Barrasso Panini Anthology Paired Pieces Dual JERSEY Card! /199! The card appears to be in. 1992 Panini Stickers # 219 Tom Barrasso. WE ARE ALWAYS PURCHASING CARDS, SINGLES, COMPLETE COLLECTIONS. YOU'LL RECEIVE EXACT CARD ABOVE WHEN YOU WIN! #TB2 TOM BARRASSO. 11/12 PANINI NHL. ON CARD AUTOGRAPH. MORE THAN 25 CARDS WILL SEND ON THE INVOICE. CLEAN BACK. GRADE - EX-MT OR BETTER. This lot consists of the Buffalo Sabres team set of 16 stickers from the 1988-89 Panini Hockey sticker collection.